She admits she "can't move on", the lyrics show she never had this person. "I look up at your house, and I can almost hear you shout down to me, where I always used to be." the guy (or whomever) clearly did not want to have this person in their life. Killing the positive message with an imbedded negative one. "I like this song" would have sufficed. Is that the click track version? I just bought a Wadia 321 DAC and I am demoing a RogueAudio Tube Preamp. The Wadia was a huge overall improvement for all things digital. The Tube amp sounds good on somethings and questionable (for me) on others. The way this song sounds on the Tube set up makes me want throw down cash for it now. Awesome to hear music on good gear!!!! An experience too few have. Yes, I was right. It's now a 9. Goddammit, this is good for my ears. Instant 8 and climbing. The only flaw to this beautiful and haunting song is the abrupt ending. Wished it lasted longer with a better finale. I bought the delux vinyl of this Album. Cost me some coin but it was totally worth it. Funny how Shawn Smith + Eddie Vedder sound so similar. Any chance of playing Buttercup by Brad? Perhaps they're practicing to be Town Criers. The first PJ song that isn't irritating. First Pearl Jam song I've heard that I would want to hear more than once. Yeaaaah! PJ! Pendulum/Yellow Moon best songs on album! I kind of glossed over PJ in the grunge days. Wasn't really my thing and radio overplay didn't help. But now when I hear some of the B-side stuff I am intrigued. This is a pretty great son, and then I see it is from a new album? Need to take a closer look at PJ, definitely. way cool voice, imo! Vedder has the ability to season the groups' music to a consistently great sound Happy New Year All! Good song. Thanks for playing, RP. Looking at the comments, there are a surprising number of PJ/Vedder haters. Personally, I've always been a fan of both. I still think 'Siren' is the best track from this album. However, as a weather fanatic, I really like the album title!! 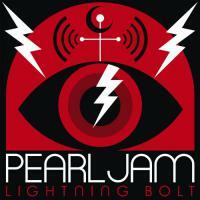 Very cool... haven't enjoyed PJ in quite a few albums... this is heading in a good direction. I usually change the channel as soon as I hear Eddie Vedder's voice but I like this song. Would be better if Eddie could actually, you know...sing. Sometimes his limited abilities actually work with the song. Not this time. Interesting sound for Pearl Jam though. This album is growing on me very quickly.. The album cover reminds me of the head of one of those cute little minions from Despicable Me...except it's red...and has lightning bolts making it look rather angry. Don't know what to make of the song yet. Second to comment. Love PJ - seeing them 3 times in next 5 days. Like this song, not yet sold on quality of new album.